Another incredibly busy month work-wise, but lots of new wildlife to report too! The stars of the show are the wren chicks right outside the door of the CSA shed. The video shows one of the adults (hard to tell the sexes apart!) feeding the brood. The chicks fledged on 25th June so listen out for a thriving wren population on the farm! Some notable birds of prey have been spotted recently. A red kite passed over the field early in the month, followed by (probably) a hobby. Meanwhile, Suffolk Wildlife Trust have visited to have a look in the barn owl boxes they installed. There is a pair of barn owls inhabiting the box at the top of the field, but there’s no sign of them breeding yet, and in fact they haven’t been since the SWT visit! 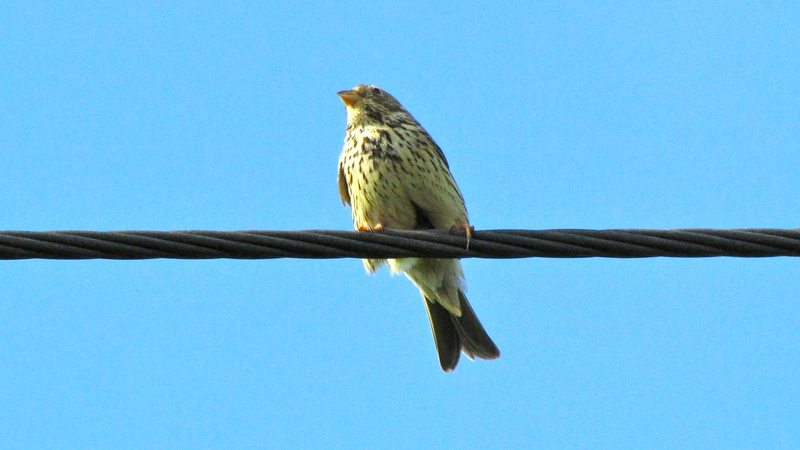 A kestrel and sparrowhawk have also been spotted, but no buzzards have been reported this month. 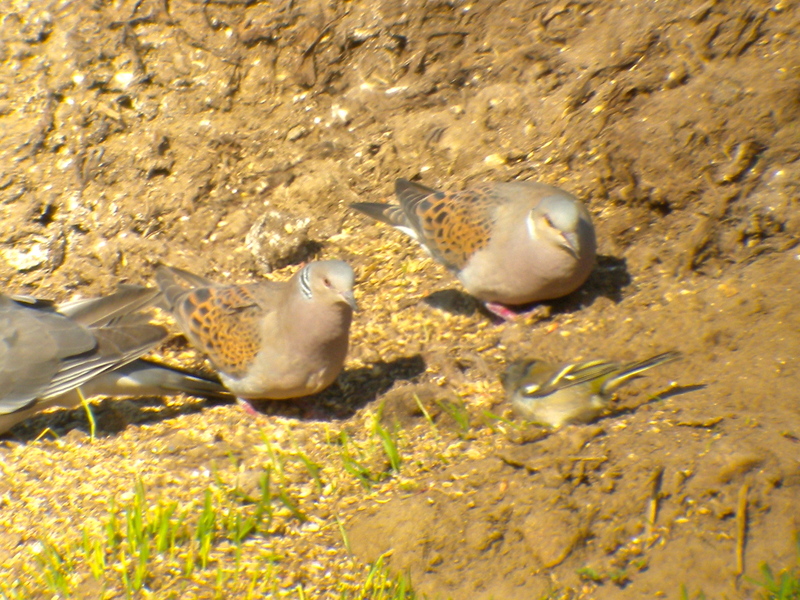 Turtle doves – now a rare sight in the UK. 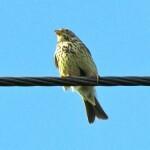 corn bunting, once a common sound in the open Suffolk farmland, is now seldom heard. There are various theories for the reasons behind these and similar declines of other farmland birds, but ever intensifying industrial agriculture is almost certainly the main cause. It would be wonderful if we could one day encourage these birds back onto the farm, perhaps through the use of more traditional and wildlife friendly farming practices. The skylarks continue to fill the sky with their song although we have so far not managed to definitively locate any nests. The swallows and housemartins swoop and circle all along the front of the field, while other summer migrants are still in evidence, but birdsong is starting to die down as birds become quieter and more secretive in order to raise their young in safety. 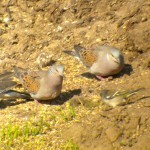 The resident greenfinches, goldfinches, blackbirds, starlings, robins and dunnocks are easily spotted, while a number of red legged partridges have been seen out in the field. 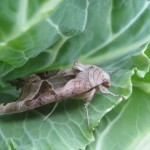 Can you identify this moth?! No new species of butterfly have been recorded this month; with spring so late some summer species are not yet in evidence. The brighter days have seen all the common whites and several small tortoiseshells and red admirals. 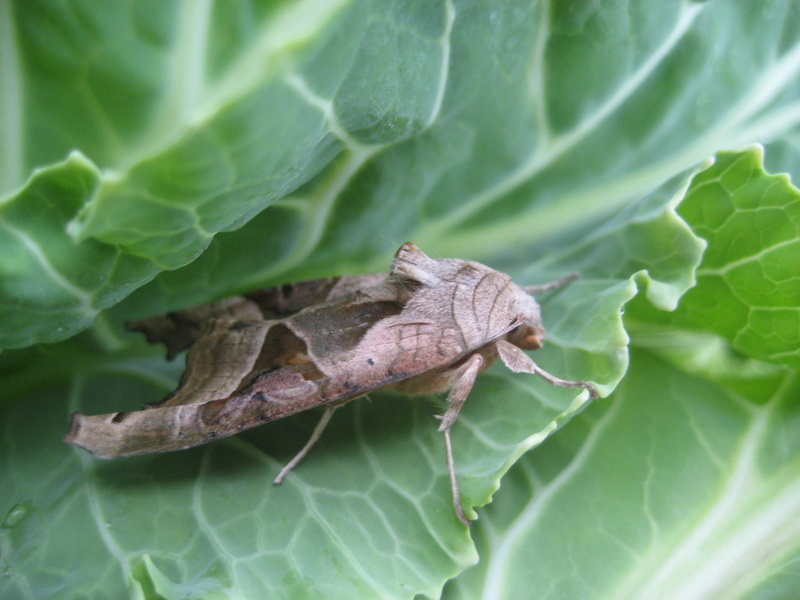 But, on the subject of lepidoptera, can anyone identify this moth found inside a cauliflower? Chris and Rowan also found a shrew while preparing some ground in one of the polytunnels, where several common frogs also broke cover. This entry was posted in general news, Uncategorized, wildlife. Bookmark the permalink.